A brief garden update: I have been eating radishes and enjoying lettuce and herbs. 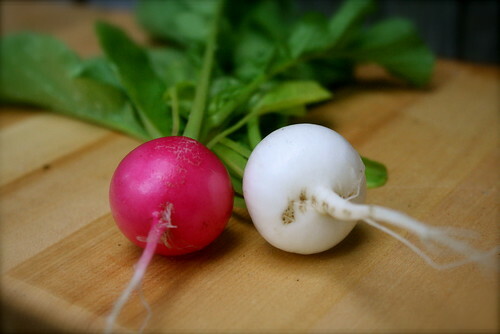 Radishes are delicious but sometimes so pretty they’re difficult to eat. The tomatoes are looking very happy and I believe I have now collected at least 7 varieties in the garden. Some heirloom, some hybrid, which makes me feel a little sleazy but we’ve all got to start somewhere. 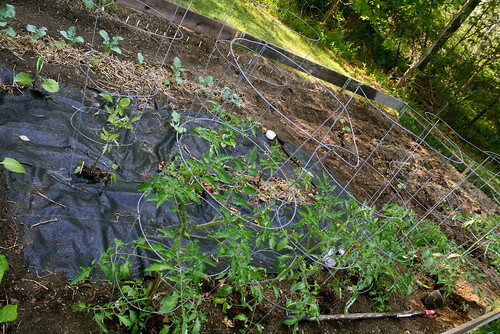 In effort to thwart the weeds I’ve put down some black plastic weed blocker. It’s not everywhere as you can see, but it will cut down some of the weeding time and keep the soil warm for the tomatoes. The only pest issue I’ve had so far is a swarm of tiny ants eating one of the broccoli plants – they gnawed at the stem until it wilted and after a few attempts at chasing them away with garlic and lemon verbena I gave up and decided to let them have it in hopes they won’t take more. If they do I’ll have to get out the big (organic) guns. There was one more pest problem – I got lazy with chicken monitoring last weekend the b*tches ate all the tops off the beets and chard! Argh. Fortunately the plants seem to be recovering all right and I have learned my lesson. Hopefully they ate some bad bugs while they were in there too to balance out the damage. My farm share with Lucky Fields Organics starts this week, so there’ll be plenty of local produce to supplement whatever I can manage to coerce out of the garden. I’m done buying produce in big box stores for the foreseeable future! Hope to learn some more preservation techniques this year and see how much can be saved for the cold months. 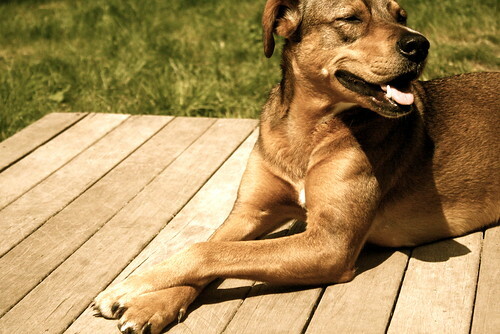 One of my favorite parts about gardening days is how much the dog loves laying in the sun on the porch. She just looks so damn content I can’t help but feel the same. Let there be more sunshine on the horizon. This is an article that was posted on Jun 5, 06:06 PM.